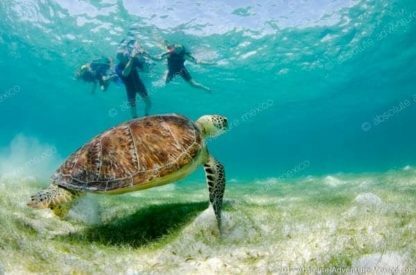 Tulum Private Tour with snorkeling in cenote and swim with turtles! 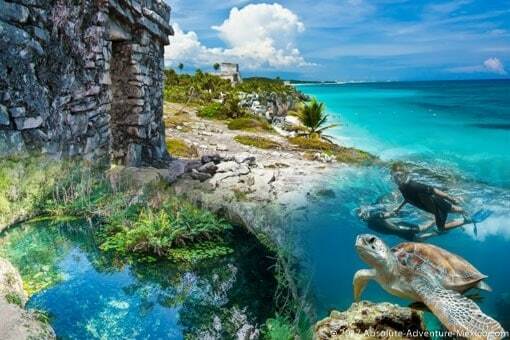 PRIVATE TOUR: Our bestseller private tour with a private visit of Tulum ruins, a swim in a cenote, a swim with turtles. 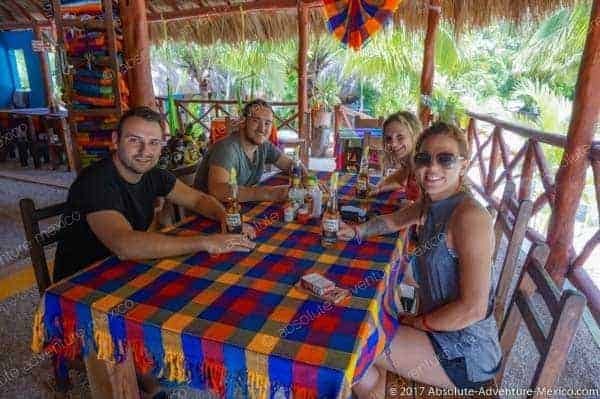 With a delicious lunch at a Mayan restaurant in the jungle. 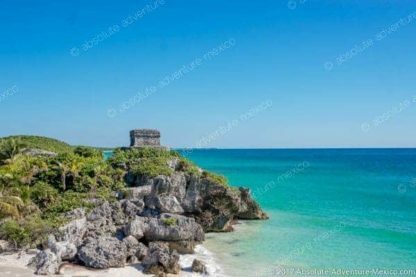 Tulum Private tour: If you’re looking for an all-inclusive day trip that combines the very best cultural and natural activities that the Riviera Maya has to offer, then this is definitely the tour you’re looking for! Not only will we take you to explore the fascinating Mayan ruins in Tulum, but you’ll also have the chance to go snorkeling in two completely different, exquisitely beautiful natural settings! 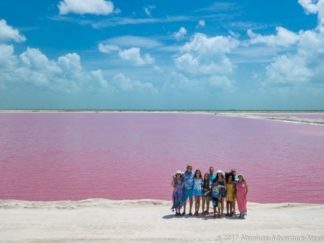 Best of all, our private tours are designed to make sure that you can enjoy each and every moment to the max while avoiding the crowds. This exciting day starts with a tour to Tulum, one of the most important remaining Mayan archaeological sites in the Yucatán Peninsula. While the Mayans used this beautiful coastal location as a trading port, today it may be best known for its stunning views of the Caribbean Sea. 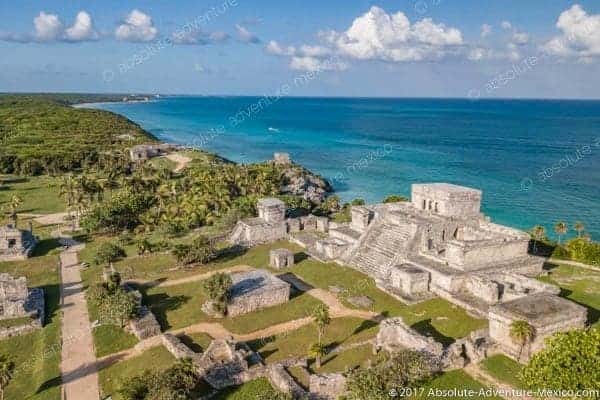 Your professional private tour guide will show you all of the site’s most interesting attractions, including the awe-inspiring Temple of the Frescoes, which contains ancient Mayan artwork. Once you’ve fully explored Tulum, we’ll take you to the next activity: snorkeling in cenote. 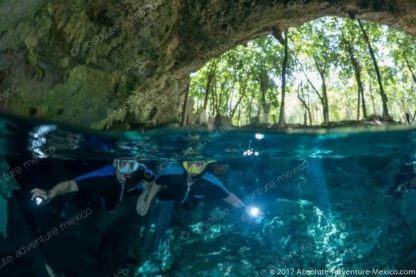 These beautiful natural underground caves formed by erosion from rainwater can be found all over the Yucatán Peninsula. 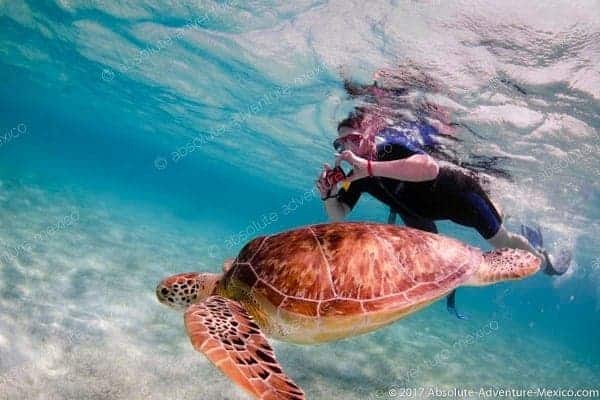 They’re the perfect place for snorkeling since there are no waves to deal with, so you can just relax and enjoy the cool waters as your certified guide shows you around. Since you’ll have undoubtedly worked up an appetite, our next stop is a local restaurant in the jungle where you can enjoy a traditional Mexican lunch. 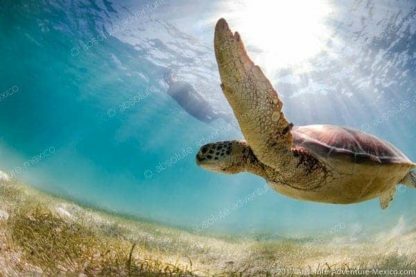 Finally, we’ll head to Akumal, a protected bay to go snorkeling yet again – this time with sea turtles! 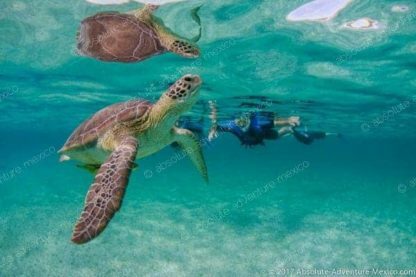 You will love swimming with these majestic turtles, plus your guide will be with you every step of the way if you need help. Today we completed our amazing private tour. We had snorkeling stops at sea turtles and cenote followed by an amazing lunch and then a private tour of the Maya ruins at Tulum. Our guide Claire was very knowledgeable and knew when and what time was the best to avoid the crowds at each stop. Juan Manuel was always there to pick us up so we never had to stand in the hot sun like other tours. We always had fresh cold drinks when we got into the van. We did the Tulum, cenote and turtle tour with Arturo. Both our guide and driver were patient and fun. Arturo took care of everything and gave us confidence to snorkel as it was our first time. Our driver Miseal stayed with our bags in the van when we were snorkeling. The overall experience felt very nice and safe! We had such a great time touring the Tulum ruins and snorkelling in a cenote and also with turtles. We all loved it. Marcel and Ervin were wonderful. They took us to the best meal we had while we were in Cancun at a Mayan restaurant in the jungle. It was a very full day but so worth it. I would recommend this to anyone travelling to Mexico. It’s so nice not to be on a bus full of people just your group and we saw the ruins before the crowds got there. Absolutely amazing time!! The tour was absolutely wonderful! It couldn’t have been better. I really appreciated arriving at the ruins at the opening of the site. We had the place for oursleves and our guide was so knowledgeble ! The snorkeling experience went super well too, with the guide giving lots of information and advices. I felt safe with the driver, he took care of our belonging in the van while we were away. I would highly recommend this small but incredible travel agency! We had a wonderful private tour including Tulum, snorkelling with turtles and in a quiet cenote. Our guide Arturo was fantastic. We would highly recommend Absolute Adventure Mexico. Top notch service, and great value. 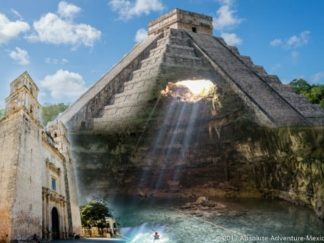 My wife Sharon and I book an adventure with Absolute Adventures Mexico. We opted for the Telum, cenotes and turtles.I can say enough about Chris’s professionalism and dedication to o making sure our day was perfect . From the start to then end it was a fantastic day!!! 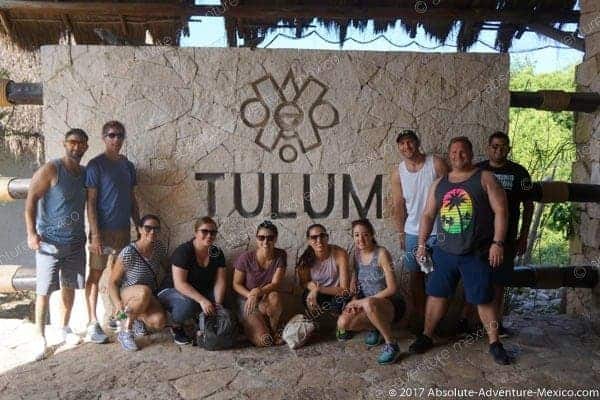 We went to Tulum, cenotes and Akumal with Absolute Adventure Mexico. Visiting Tulum in the morning is a must do, we were there before large groups and had a amazing lightning to take pictures! Swimming in the cave was spectacular and our guide Claire explained us everything about the cenote. Finally we went to Akumal to snorkel with sea turtles. We saw 6 of them from very close, it was fantastic! Thanks Claire for this day. We went to Tulum, Akumal and a cenotes. 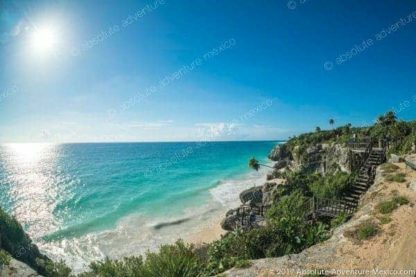 Visiting Tulum in the morning a must do! We arrived at the opening and it was awesome as we got the ruins for ourselves. No one was on site, we have great pictures! Then both cenote and turtle snorkeling were amazing. Our group had a very pleasant day, it was so worth it! We booked the Tulum, Cenote and Turtle swim tour with this company based on Tripadvisor recommendations, so thanks to those who took time to write up their experiences. Claire was patient with us as snorkelling novices, and thanks to her knowledge, we were able to see 5 or 6 lovely turtles. Then followed what for me was the highlight of the trip- swimming in the Cenote. For most of the time, we were the only people there, and I can say that this was a very special privilege, to appreciate the tranquility and beauty of this place which is sacred to the Mayans. It was something we would never have experienced otherwise and Claire was experienced in leading us through the silent, clear water in a way which allowed us to enjoy the beauty of the place while respecting its fragility and without worrying about getting lost! 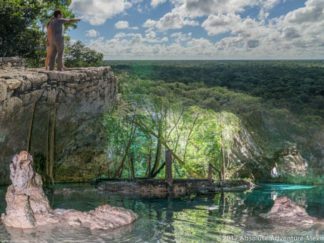 In fact you cannot visit this Cenote without a guide. As other reviewers have said, the meal in the jungle and Tulum were also great. I enjoyed learning a bit about Mexico and the history of the Mayans over lunch from Claire, who is a great source of knowedge and takes her tour guiding very seriously. All in all, highly recommended to anyone who appreciates something special and thanks to Claire for making it a memorable day for myself and two grown up children. My wife and I had the pleasure to spend an entire day of our June honeymoon with Chris from Absolute Adventure. We had a private, guided visit to the ruins at Tulum, a wonderful snorkling trip in a cenote, and close encounters with turtles and other sea life in the ocean, all in one tour! 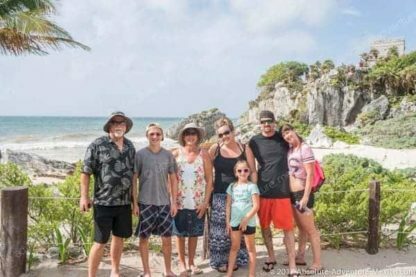 Chris was extemely competent, helpful and entertaining, and I’d highly recommend that anyone looking for some fun and adventure in the Yucatan should give him a call! This excursion was amazing & our guide Marcel was great. We got to see a cenote with underwater caves, snorkle with sea turtles, and see the amazing Tulum ruins. All of which exceeded what I expected. Also, to top in all off we had an authentic mexican/mayan lunch which was delicious, better than anything we had at the “upscale” all inclusive resort we were staying at. One of the best tours I have ever done. They picked us up right on time with a clean, air-conditioned van that was fully equipped with drinks (including beer!) and various varieties of chips. Marcel, our tour guide, was very friendly and knowledgeable. Also, the food at the restaurant we went to was AMAZING!! Probably better than the food at our 5 star all inclusive resort! The took us to Tulum first so we could beat the heat and the crowds. As we finished the tour, there was a huge line to get in so going there first was great! Then we went to the cenote which was beautiful. 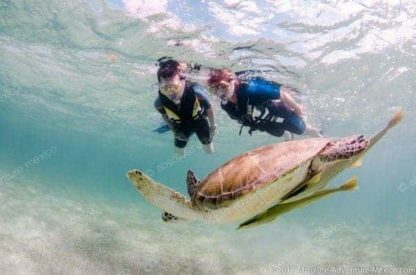 We booked an awesome day trip with Claire where we went on private guided tour of the Tulum ruins and snorkeled in a cenote and with turtles! We were a group of 4 adults visiting Mexico for the first time with no snorkeling experience. Claire was incredible patient and super prepared with all the gear (wetsuits too! ), even brought along umbrellas which were helpful when it started to rain during the ruins. We were one of the first people entering into Tulum which allowed for us to take some awesome pictures. During the snorkeling, my mother had some issues snorkeling but Claire was patient and incredibly accommodating in assisting her so that she was able to enjoy the cenote and see turtles. She also took us to an delicious lunch at a Mayan restaurant and was super informative about the people/places we visited. Overall my family and I thoroughly enjoyed the tour and will be looking to book our next excursion with Absolute Adventure when we return to Playa next year. 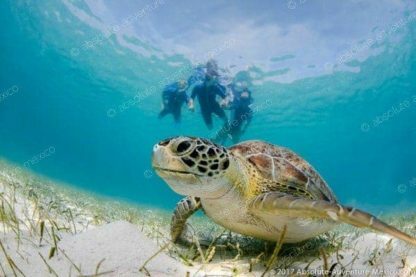 We did our booking after reading comments on tripadvirsor and went to the Tulum, snorkel in a Cenote and with sea turtles. On the day, we met Arthuro and Misael at our hotel lobby. They were incredibly patient and fun! Arturo helped us learn and feel comfortable with snorkeling. He was knowledgeable and made this day amazingly interesting. Misael took care of the van and made sure our bags were safe while we were enjoying activities. Thank you for this unforgettable day. I am glad to share the word and recommend this agency.